Ok, so cake is my downfall! And so is chocolate …. So you can imagine the problems I have with chocolate cake! My favourite ever chocolate cake recipe is Nigella’s Quadruple Chocolate Loaf cake … but at 25 SmartPoints per slice I just can’t do it anymore! My mindset has changed since starting on my Weight Watchers journey and I can’t eat a whole days worth of points in one treat. I just can’t! Anyone who is following Pointed Kitchen on Instagram may well have seen that I had a couple of ‘incidents’ with the chocolate chips I had bought to make this cake. I just couldn’t stop eating them … all 54 SmartPoints worth of them! Two days worth of SmartPoints in less than 24 hours! Draw a line & tomorrow is another day and all that! So after two false starts. I eventually made this Choc Chip Zucchini Bread. I am not saying that this has the chocolate gooeyness of Nigella’s heavenly creation but it is good! It is soft, moist, chocolatey and what is more it is rich, so you don’t feel like you want to over indulge with it. It has a subtle banana flavour but the overall flavour is more chocolatey. And if you are worried about the addition of zucchini (courgette) don’t be! You really can’t tell that it is there. The zucchini’s job is to bulk out the bread and add to its moistness and overall gooeyness. And at 5 SmartPoints per slice it is now my favourite Weight Watchers friendly chocolate bread / cake. 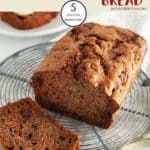 This bread is just perfect served just as it is with a large cup of tea or coffee! I also like to eat it warmed, with a layer of sliced banana and a dollop of thick and creamy Greek yogurt. As well as preparing the tin with a light coating of oil, I also added a strip of silicone. I find it easier to remove the bread from the tin when I do this, but it is by no means essential. As long as the tin is lightly greased it should release from the tin easily. 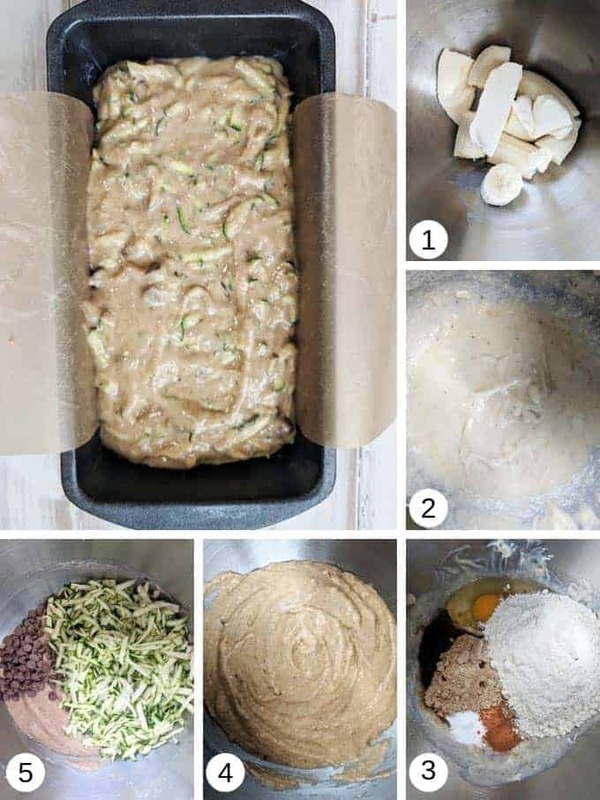 Use a good quality, heavy loaf tin for this Choc Chip Zucchini cake as this will help prevent the cake sides and bottom from drying out too much. Blend or mash the bananas with the softened butter (pic 1) until they make a smooth pale puree (pic 2). You can do this with a handheld immersion blender, like this one, or if your bananas are really ripe you could use the back of a fork or a potato masher. Add the flour, egg, cinnamon, baking soda, salt, vanilla and sugar (pic 3) and mix so that all the ingredients are combined. The mixture should be thick and lump free (pic 4). Add the chocolate chips and the grated zucchini / courgette (picture 5) and fold into the mixture. Spoon the mixture into a prepared tin (approx 8 x 5 inches). Bake in the centre of the oven for 50 mins to 1 hour. After this time a toothpick inserted into the middle of the cake should come out clean. The cake will also have risen and turned golden brown. Remove from the tin and leave to cool on a wire rack before tucking in! I used Lurpak Lighter Spreadable Slightly Salted Butter in this recipe. It is a reduced fat blend of butter and vegetable oil. This worked out at 15 SmartPoints worth of butter. I have also made this Zucchini Bread using Blue Bonnet vegetable oil spread. The SmartPoints stay the same. Use normal butter and the SmartPoints will increase to 6 SmartPoints per slice. Use a good quality heavy non stick loaf tin, like this one available from Amazon. Using a good quality tin prevents the side and bottom of the bread from cooking too quickly and drying out. I used an immersion blender, like this one available from Amazon to blend the butter and banana into a smooth puree. I used good quality choc chips like these ones from Ghirardelli, which are available from Amazon. 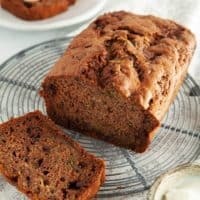 If you like this Choc Chip Zucchini Bread recipe, you may also like this 7 SmartPoint Apple Cake recipe or these Pumpkin Spiced Scones. These Apple Turnovers are also very popular if you are looking for a lower SmartPoint treat! 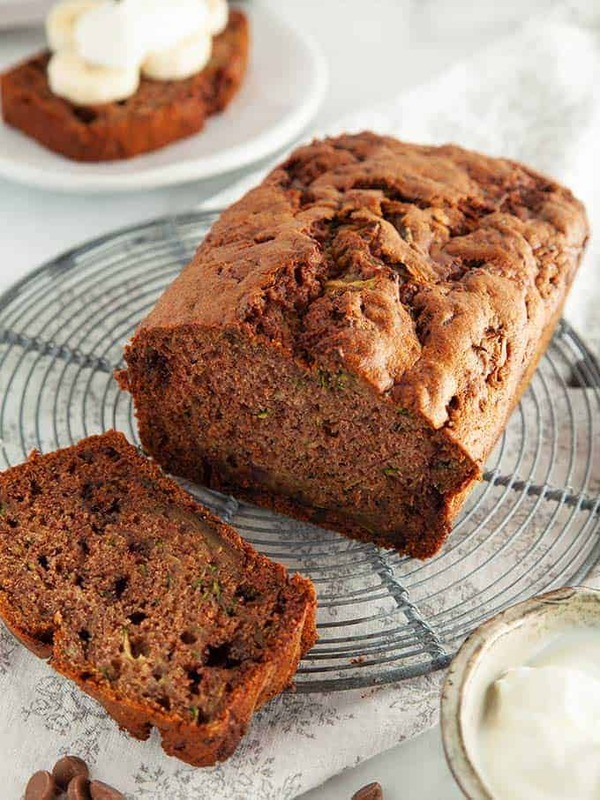 This rich and moist Choc Chip Zucchini Bread is just 5 SmartPoints per slice on Weight Watchers Freestyle plan. Grease a loaf pan (approx 8 x 5 inch) with a little butter (or calorie controlled spray oil). Set aside. Place the bananas and softened butter into a large bowl. Mash them together till they form a smooth puree. Add the sugar, egg, vanilla paste, cinnamon, flour, baking soda and salt and mix together until all of the ingredients are combined. Fold in the grated courgette and chocolate chips. Spoon into the prepared tin. Bake for 50 minutes to 1 hours until the cake has risen and turned golden brown and a toothpick inserted into the middle of the cake comes out clean. Serve just as it is, or with sliced banana and a spoonful of fat free yogurt on top!